I call it a launch sequence. It’s the daily routine that I use to initiate high productivity for my entire day. But before jumping into specific structures or whether it’s better to be a night owl or an early bird, it’s important to focus on mindset. Did you hit your snooze button this morning? How do you think that small action impacts your day? How often do you start your day with procrastination? Do you think this will help you build healthy, positive habits? This is what I mean by mindset, and you have a role in creating it. Do you think that starting the day by pushing off the things you need to accomplish is going to help train you to take action later? It’s a mindset, a mental game that we all play. Through neuroscience, we’ve learned that the more you engage in a particular habit or mindset, the more likely you are to continue that habit or mindset. It’s called neuro-plasticity. Brain cells that activate more frequently build more connections, making it easier for them to work more efficiently. Translation: your patterns of behavior are hard to develop, but once you do, it’s easier to maintain them. This is the same reason why catharsis (venting, complaining, punching a wall, acting out, etc.) doesn’t work. It just trains your brain to keep doing things that way. It’s why quitting smoking is SO hard — and it’s why putting your shorts on is the most challenging part of going to the gym. I don’t really have a routine, and I still feel productive. Have you tested a morning routine? But they often haven’t even tried exercising in the morning. If they had, they might have felt the benefits of recovery hormones and better blood oxygenation for the rest of their work day — but hey, everyone is different. No matter what; do what works for you. Test it. Then you’ll know for sure. How do I turn my dream into a reality? Prioritizing this list is the only thing that will keep you from being overwhelmed by huge ambition. I want to speak Spanish fluently. I want to have control over my thoughts and emotions so I can stay focused and not ruminate on negative thoughts. I want to be fit enough to get on the floor and play Legos with my grandkids. I want to love the body I’m in. I want to stay mentally sharp. I want to read more fiction. I want to stay on top of the news. Remember that Psych 100 course you took in college? I don’t either. But let’s do something that school should have taught you to do, but didn’t; apply knowledge. 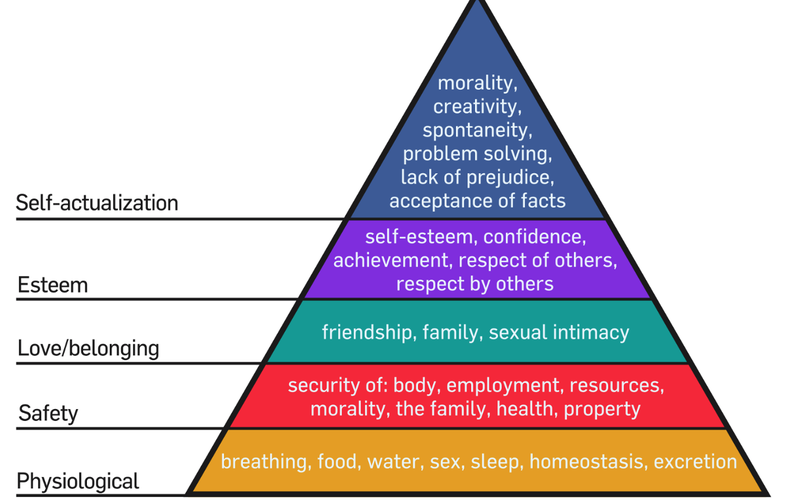 One is from that Psych 100 class; Maslow’s Hierarchy of Needs. The point here is to figure out what you really want and whether your current trajectory will get you there. WARNING: This is really, freaking hard. It’s super easy to lie to yourself about why you’re doing what you’re doing. Any of these lines sound familiar? Not if your degree isn’t going to get you closer to your dream. Nope. It’s a number. Most employers just care about performance. Focus on what matters. Take a good look at these two pyramids and decide what’s really important in your life right now. Maybe it’s not the best time to focus on learning Farsi if you should really be looking for a job. Or, maybe you shouldn’t be putting in so many hours when you really need to sort out that argument with your Mom. 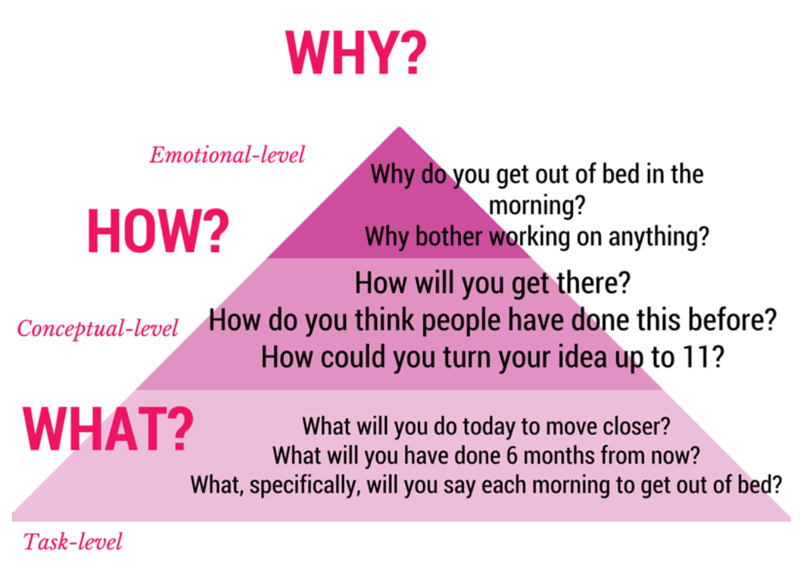 Consult the pyramid; young Padawan. Below is my launch sequence for my day. You can see how I’ve taken these opaque dreams and converted them into actionable routines that get me closer to self-actualization every single day. Waking up and watching myself approach my ideal future is one of the most positive, motivating, and helpful feelings I can leverage to get through the tough parts of my day. 7:30a — Wake up and make a protein shake. 1st breakfast. 8:00a — Gym. Run 1–2 miles. Row 1km. Lift weights. Stretch. 9:00a — Second breakfast. Usually eggs and something exciting. 12:00p — Check email. Then break for Lunch. Never start your day with someone else’s work. Always focus on your day, first. You’re going to mess this up. I mess this up all the time. The point is not to be perfect at doing this everyday. That’s not feasible. The point is to promise yourself you’ll fall forward. If you’re a perfectionist, like me, and having trouble being nice to yourself when you miss a day (or a week), read this post on letting go of perfectionism and give yourself permission to be awesome.